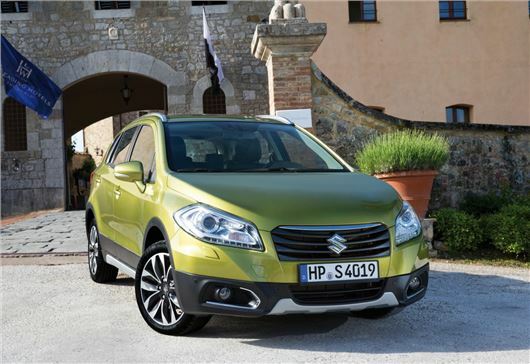 Suzuki has announced pricing details for its new SX4 S-Cross crossover. Four equipment grades will be offered with prices starting at £14,999 for the entry level SZ3, rising to £23,549 for the top-spec 1.6 DDiS SZ5 diesel with all-wheel drive. Both 1.6-litre petrol and 1.6-litre diesel engines are offered and the cleanest model achieves 110g/km emissions. Each produce 120PS, though the diesel creates more torque. The 1.6-litre petrol engine is available in combination with a CVT automatic or five-speed manual gearbox and has emissions of 127g/km in manual form or 125g/km with the CVT. Buyers can specify all-wheel drive if they wish, which increases emissions. Fuel economy for the petrol engine ranges from 47.8mpg for the all-wheel drive manual to 51.3mpg for the front-wheel drive car. A 1.6-litre DDiS diesel engine is offered too and has emissions of 110g/km in front-wheel drive form and 114g/km in all-wheel drive form, with economy 67.2mpg for the front-wheel drive and 64.2mpg for the all-wheel drive. The diesel engine is mated to a six-speed manual transmission and isn’t available with an automatic gearbox. For more information about equipment levels and a full road test of the SX4 S-Cross click here.